Artifacts, personal and pop cultural totems, and even the dead have made the journey from our planet to the outer reaches of the heavens. We've covered some odd things that have gone to space before; here are a few more strange things that took a trip to the cosmos. Thanks to Celestis, a company that specializes in booking “memorial spaceflights,” and an agreement with private rocket company SpaceX, the remains of several people who have passed away have been launched into the great beyond (for a couple of hours, at least). Star Trek creator Gene Roddenberry's remains were on the inaugural Celestis flight in 1997; his remains took flight again in 2012 with the remains of actor James Doohan, who played Scotty. Astronaut Gordon Cooper’s ashes were also on that flight. Lots of strange things have been brought to space in the name of science—including salmonella. Two shuttle flights to the International Space Station (ISS) contained samples of salmonella to determine how the bacteria would react to low gravity, and the findings were kind of scary. When the salmonella returned to Earth after being in orbit for 12 days on the space shuttle Atlantis, the bacteria became even more virulent. In the first study to examine the effect of space flight on the virulence of a pathogen, the bacteria that had taken a space trip was three times as likely to kill the lab mice as the salmonella that was kept on Earth in as close to similar conditions as possible. Tardigrades, a.k.a. water bears, became the first animals to survive exposure in outer space. The eight-legged creatures typically spend their days on a moist piece of moss or enjoy feasting on bacteria or plant life at the bottom of a lake, but they survived being frozen at -328 degrees Fahrenheit or heated to more than 300 degrees on their trip to space. The water bears, which typically don’t grow more than one millimeter in length, were dehydrated and exposed in space for 10 days by a group of European researchers. Back on Earth and rehydrated, 68 percent of the tardigrades that were shielded from the radiation survived. A handful with no radiation protection not only came back to life, but later produced viable offspring. 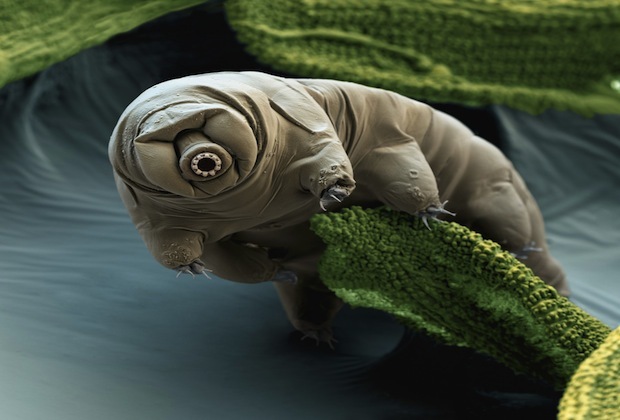 Excitedly, an “amateur tardigrade enthusiast” theorized that the water bears must be extraterrestrial in origin if they can handle such conditions, but that claim has boringly been denied by the Swedish and German scientists, who made up for it by naming their experiment "Tardigrades in space," or TARDIS. Without gravity, samples of animal sperm don’t work the way they should. Putting bull sperm in orbit resulted in the tiny cells moving faster than usual. Meanwhile, in sea urchin sperm that flew on NASA missions [PDF], the process of phosphorylation screeched to a halt when the enzyme known as protein phosphatase didn’t do its job. In 1979, two female rats that went to space became pregnant but didn't carry the fetuses to term, and the males’ testes shrank along with their sperm count. Fortunately (or unfortunately), one creature has been able to reproduce far from our planet: the cockroach. Since the medaka’s organs are clearly visible thanks to its transparent skin, they were the obvious choice for astronauts and scientists to test the effects of microgravity on marine life—and to help determine why astronauts suffer from a decrease in bone density while in orbit. Bones naturally break down and rebuild, and osteoclasts help break down the bones while they're under construction, as it were. In space the process gets wonky, which is why astronauts take part in two-hour high-intensity exercise routines and take vitamin D supplements. With the medaka’s help, scientists discovered that pesky, time-consuming space exercise could be avoided, and by finding the mechanism in bone metabolism, it may lead to a development of a treatment for osteoporosis. In 1985, small bits of bone and eggshell from the duck-billed dinosaur Maiasaura peeblesorum were brought along a mission on SpaceLab2 by astronaut Loren Acton. Thirteen years later, the skull of a meat-eating Coelophysis from the Carnegie Museum of Natural History was a passenger on a trip to the Mir space station. 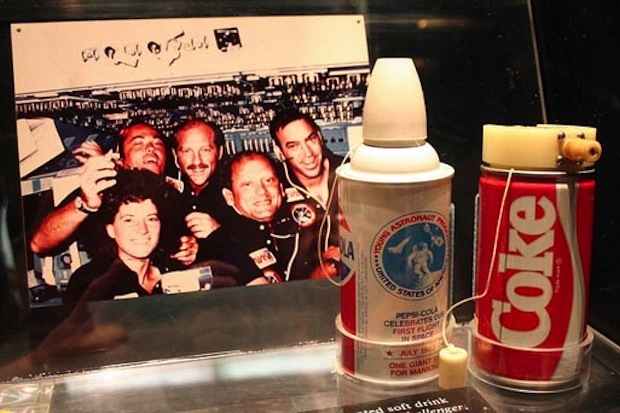 In 1984, Coca Cola decided that they wanted to be the first carbonated beverage on a space shuttle. They spent $250,000 developing a can that would work without gravity that would also keep the drink fizzy and not spill all over the place, even changing some of their formula. NASA agreed, and Pepsi responded by saying it felt left out. NASA then announced that any soft drink could participate if they created a viable container. Only Pepsi responded to the challenge (poor RC Cola). In 1985, four cans of Pepsi and four cans of Coke were on board the Challenger; the day shifters drank Coke, and the night owls consumed the Pepsi. Neither of the sodas were to their liking. Sometimes nobody wins The Pepsi Challenge. Pizza Hut wasn’t satisfied with simply being the first company to advertise on a rocket in the year 2000, so one year later they paid the Russian space agency about $1 million to become the first company to deliver a pizza to someone in space. The pizza delivered to cosmonaut Yuri Usachov included a crispy crust, pizza sauce, cheese, and salami (because pepperoni grows moldy over a certain period of time). Extra salt and spices were also added to compensate for the deadening of taste buds from space travel, and it was delivered in a vacuum seal. Usachov gave the pizza a thumbs up. The private spaceflight company SpaceX placed a wheel of Le Brouere cheese on an unmanned spaceship to honor the classic Monty Python’s Flying Circus cheese shop sketch. To add to the pop culture celebration, SpaceX went a little more obscure but more American, sealing the cheese wheel in a metal cylinder with the image of the film poster from the 1984 Val Kilmer movie Top Secret!. It was claimed to the first cheese to travel to orbit on a commercial spacecraft. The entire incident lasted 30 seconds, with the sandwich only being consumed for 10 of those seconds, before being put back away inside Young’s flight suit. 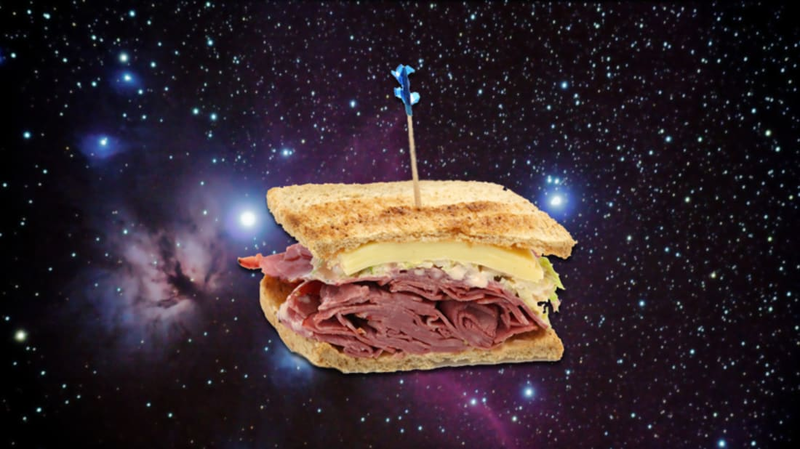 While legend has it that Yuri Gagarin was accompanied by a homemade salami sandwich in 1961, the Russians had a specialized vacuum kit so they could clean up after eating to prevent any clogging of shuttle equipment. The Americans were just supposed to consume food from tubes, so Young was putting himself somewhat at risk for the five hour mission. The astronaut got a stern talking to; he later landed on the moon during the Apollo 16 mission. Unlike astronauts, Soviet cosmonauts went into space locked and loaded, carrying a triple barrel TP-82 capable of 40 gauge shotgun rounds. The heavy duty big boy weapon was deemed necessary after 1965, when cosmonauts landed on Earth stranded in the Ural Mountains and needed to keep wolves from making them dinner. In 2006, however, the TP-82s were replaced with your standard semi-automatic. A Buzz Lightyear toy spent 467 days in space, orbiting the Earth on the ISS before having a ticker-tape parade in Disney World’s Magic Kingdom thrown in his honor. The toy’s namesake, Buzz Aldrin, was a special guest. Amelia Earhart was the first president of an international organization of licensed women pilots called The Ninety-Nines. One member of that group is astronaut Shannon Walker, who was presented in October 2009 with a watch, owned by current group director Joan Kerwin, that Earhart wore during her two trans-Atlantic flights to bring onboard the ISS. Earhart, of course, was the first female trans-Atlantic passenger in 1928, and flew from Newfoundland to Northern Ireland solo on May 20, 1932. She gave her watch to H. Gordon Selfridge Jr., who passed it along to Ninety-Nines charter member Fay Gillis Wells. Kerwin acquired the watch at an auction. Stephen Colbert, as he is wont to do, managed to crash an online contest, and with enough write-in votes technically won the right to name a room at the space station after himself. NASA reserved their right to ignore write-in votes, but compromised by naming their second-ever model of treadmills after him, dubbing it the Combined Operational Load-Bearing External Resistance Treadmill, or COLBERT. The manufacturer of the treadmill nickel-plated the parts, and unlike a standard treadmill, there are elastic straps that fit around the shoulders and waist to keep the runner from careening across the space station. The announcement was made by astronaut Sunita Williams on an episode of The Colbert Report; Williams ran a marathon on the previous treadmill while living at the space station in 2007, jogging in place with the concurrent Boston Marathon.